I can't believe criminals haven't jumped onto thermal cameras because they're apparently BOSS at stealing your ATM PIN number. Not only can they figure out the set of numbers in a pin but sometimes they can even tell the order too. Scary. 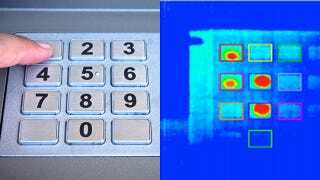 Researchers from UCSD pointed thermal cameras towards plastic ATM PIN pads and metal ATM PIN pads to test how effective they were at stealing PIN numbers. The thermal cams didn't work against metal pads but on plastic pads the success rate of detecting all the digits was 80% after 10 seconds and 60% after 45 seconds. If you think about your average ATM trip, that's a pretty wide window and an embarrassingly high success rate for thieves to take advantage of.